NetherRealm Studios' Ed Boon says that Mortal Kombat won't need patches to keep everything running smoothly. Character tiers are just one of those unavoidable facts about fighting games: Cable is better than Wolverine, Kazuya is better than Yoshimitsu, and Sagat is better than, well, everyone. But Boon says that this won't be a problem in the new Mortal Kombat, as the game can be adjusted without the need for big patches. He said that while every effort will be made to make the game as balanced as possible at launch, over time, players will find the exploits and some characters will have distinct advantages over others. Boon said that NetherRealm added the ability to "turn knobs" in the game, and while it won't be able to do things as major as adding or removing special moves, it will be able to slow down a projectile or change the amount a damage a move does. Boon also said that NetherRealm plans to be quite aggressive with DLC for the game, with new characters being high on the list. He said that the core of Mortal Kombat's roster would come from the first three games, but that DLC was a great way to introduce characters from MK4 and onwards, as well as totally new characters. It was going to be a challenge, he said, to make sure that everyone had the data for the new characters, even if they hadn't bought them, as NetherRealm didn't want to split the player base. "We're going to need a patch or some kind of delivery method-and we're still trying to solve it," Boon said. "One option is a free character that everybody gets and gets you all the purchasable ones too. If you download a free version of Raiden or whoever, you'll get everything." 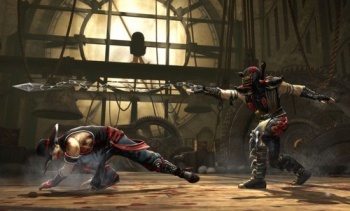 Mortal Kombat comes out for Xbox 360 and PS3 in the first half of next year.